On the Chinese Lunar calendar, the new year begins on Friday, February 16, 2018 and bow-wow-wow, it’s the year of the dog. The occasion only rolls around once every 12-years in the repeating cycle of animals of the East Asian zodiac. 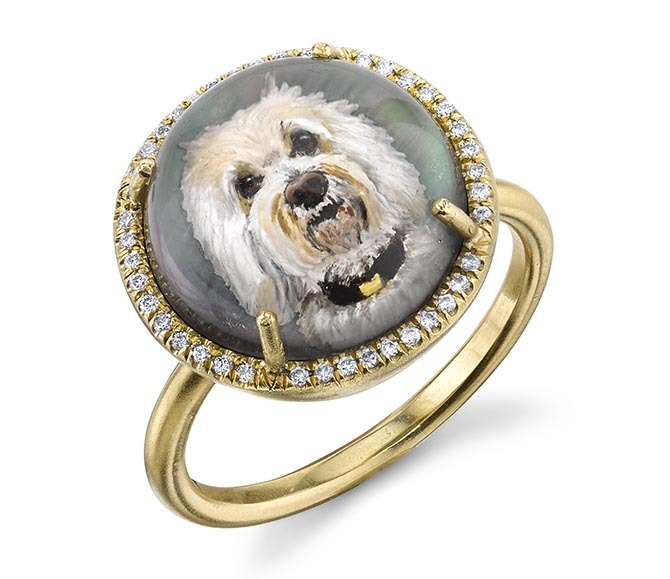 Why not celebrate it, and the best animal on earth, with a jewel? 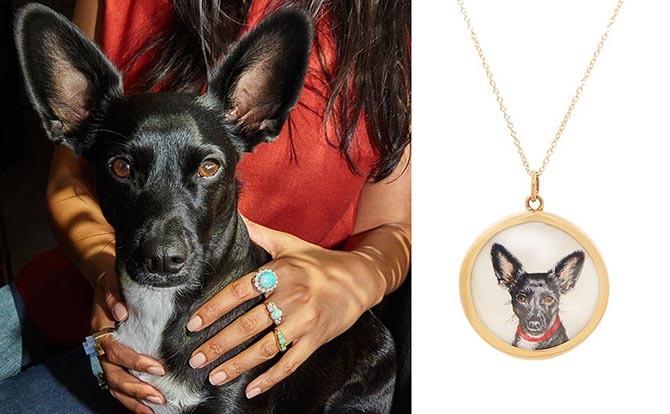 The most delightful dog jewelry styles have portraits of our four-legged friends. 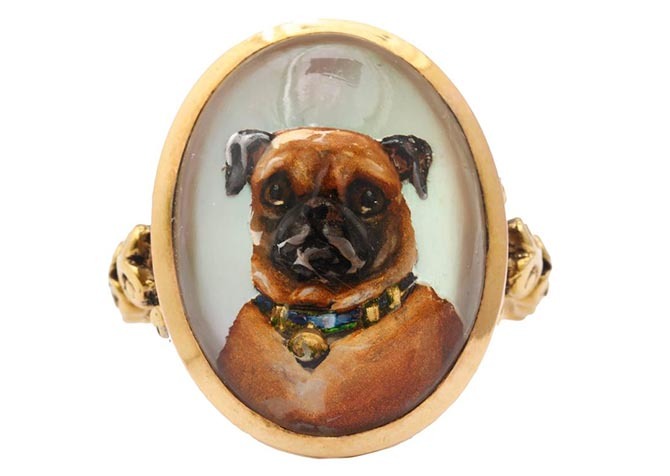 Pieces that capture the sass and personality of dogs. Ones that make them look like they are about to talk like the animals in Wes Anderson’s forth-coming live action film The Isle of Dogs. 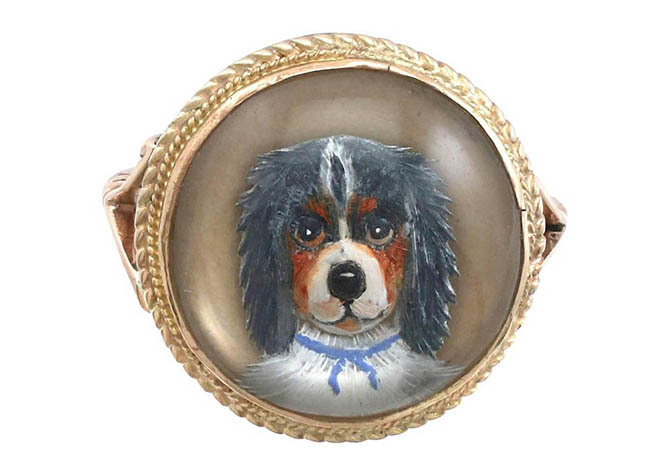 Reverse carved crystal painting is one of the best ways dogs have been depicted in jewelry. The time-honored technique has a history that dates back hundreds of years. The glory days went from the Victorian era to the 1920s. Artists painstakingly carved the crystals and then painted all kinds of animals and wildlife scenes on the mineral. Charming pieces can be found on the vintage market today (see examples below). 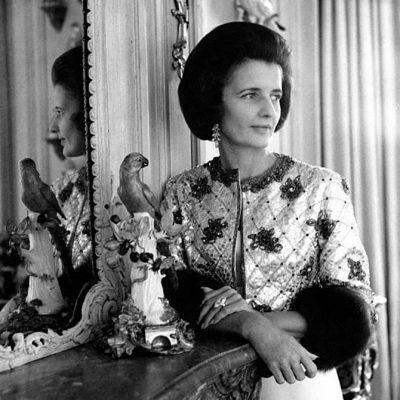 According to my friends at Antique Jewelry University, the style is often referred to as Essex crystals because somewhere along the way it was mistakenly believed that a miniaturist named William Essex was responsible for inventing or popularizing the technique. 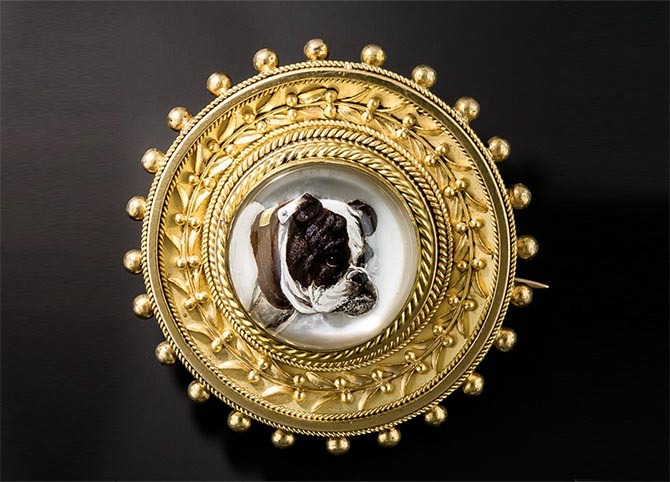 Jewelry designer Irene Neuwirth revived carved crystal paintings of dogs and a few cats in her jewelry around four years ago. She works side-by-side with a master craftsman from Germany on dog portraits to make sure the paintings are impressionistic and playful, reflecting her colorful vibrant style. Each piece is then mounted into a gold and gem-set jewel. 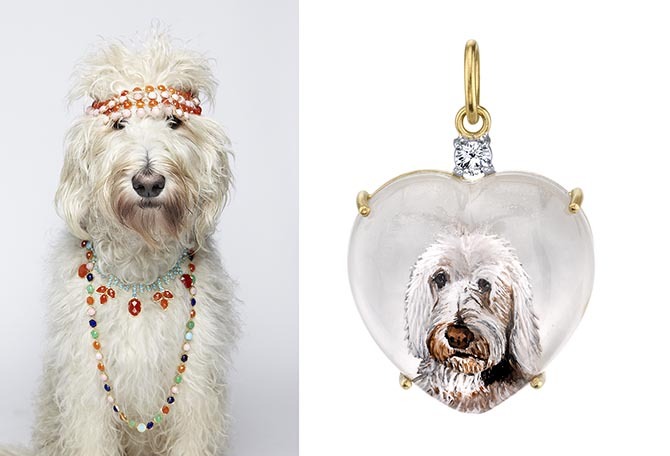 Irene’s beloved Labradoodle Teddy has been the subject of a few sittings including in a heart pendant and one glorious ring. 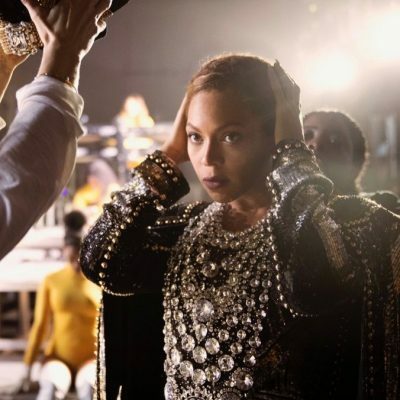 The jewels can be commissioned through Irene’s boutique in Los Angeles on Melrose Place, call 323-285-2000. 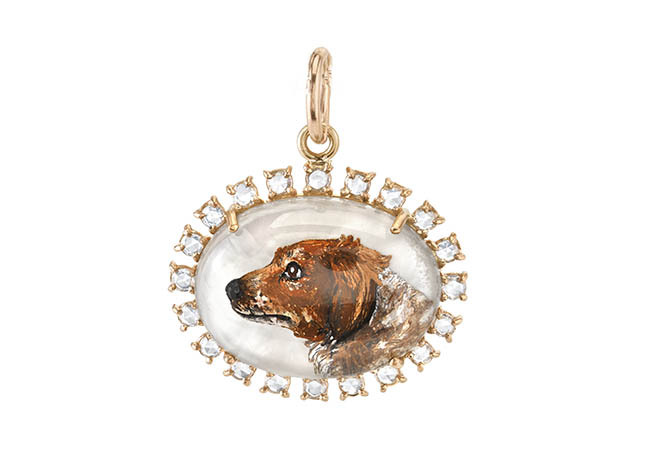 Designer Elizabeth Locke celebrates dogs in her jewelry by finding fabulous examples of vintage carved crystal paintings and setting them into her gorgeous gold pendants. 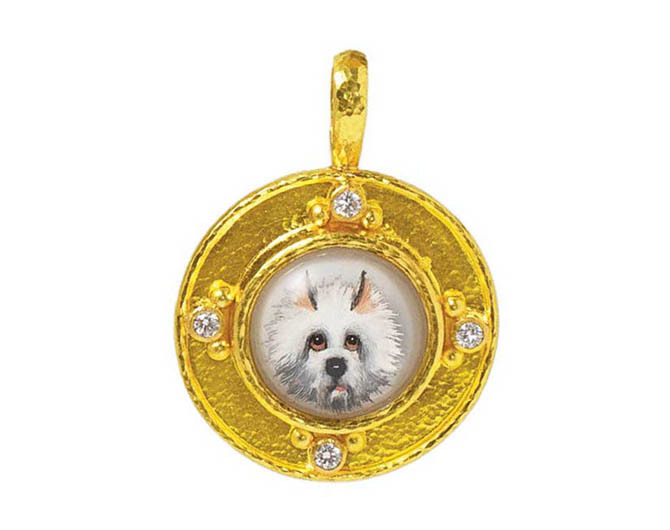 Elizabeth also sets amazing antique examples of dogs in micromosaic portraits in her pendants. These little works of art are tiny renditions of larger mosaics, created in basically the same way. Minute pieces of glass or tesserae are fitted together in the portraits. 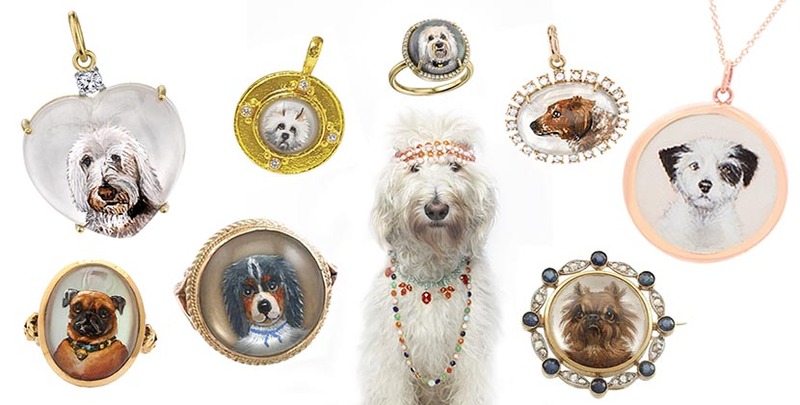 The online boutique Fox & Bond works with painter Whitney Arrington who makes delightful portraits of their clients dogs. 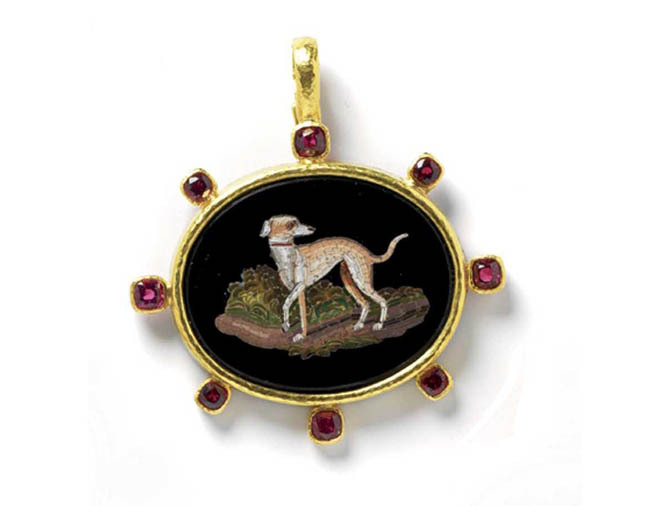 Then the miniatures are set in 14K gold locket style jewels. 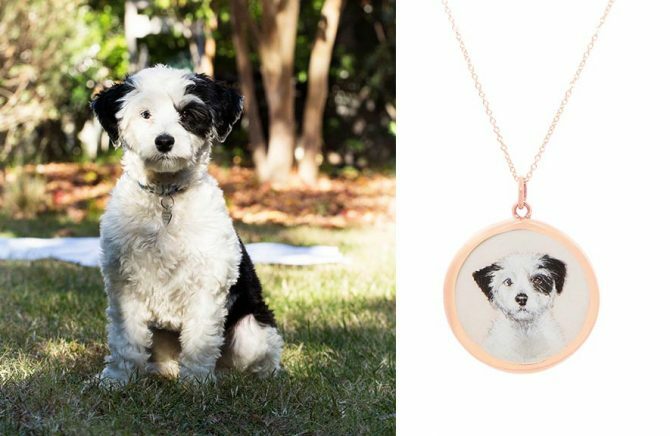 A portion of the proceeds from each Fox & Bond custom hand-painted pet portrait is donated to TAPS, The Animal Protectorates, a Los Angeles based no-kill animal shelter. Giving something back to the creatures who give us so much, well, there probably is no better way to celebrate the Year of the Dog. 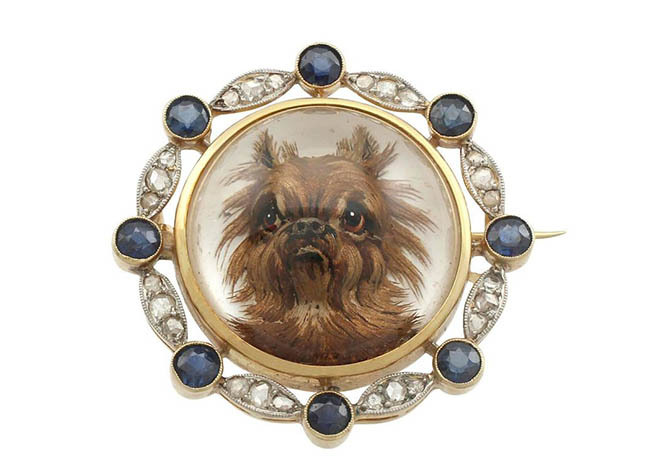 Antique brooch with a crystal portrait of a Brussels Griffon set in a gold, diamond and sapphire brooch, circa 1880.